It’s Monday and Monday is Funday! Or the day the Premier League referee appointments are announced. Same thing. There are no big games this week, so nothing really surprising or unusual. Howard Webb will be at Southampton; let’s hope he doesn’t hurt Princess Adam Lallana’s little feelings by commenting on the weather or anything. In other news, it’s always nice to see Sian Massey on his team. Speaking of clubs that hate Mark Clattenburg (it’s a bit of a list), he’ll be overseeing Chelsea again, this time at Hull City. 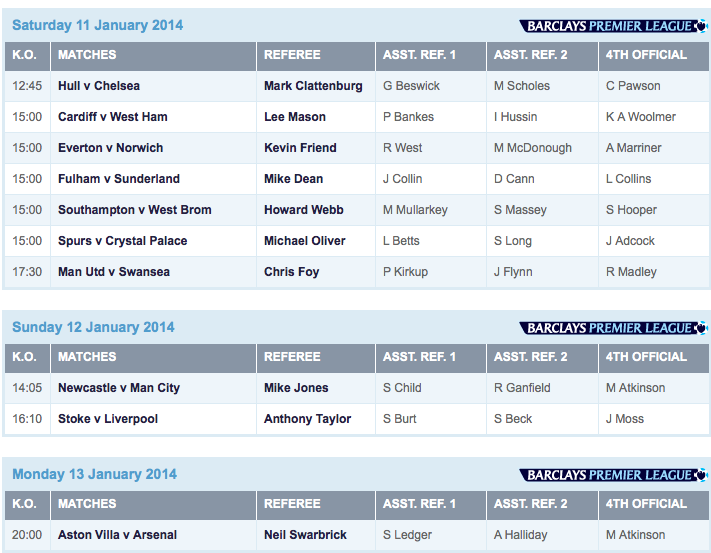 The highly-rated Andre Marriner and Martin Atkinson will only serve as fourth officials this match week. Phil Dowd doesn’t have a match this week, even as a fourth official. Can’t read too much into it; the 50-year-old has really improved his fitness this year, and he oversaw Swansea-Manchester City on New Year’s Day. Hopefully, he’s just taking a break.